You are viewing used 1994 Chevrolet S-10 LS 2dr Extended Cab SB offered for sale. Find out here most detailed specifications, photos and review. If you like this car, you can also find here information about auto dealer(if available) and contacts them using provided contact information. Tired of public transport and endless walking? Want to spend less time commuting and more time with your family and friends? Chevrolet S-10 – is the answer! This car will make your life much easier and more comfortable and you are sure to fall in love with it from the first sight. First of all, you should know that Chevrolet is a well-known automaker, one of the largest and most prestigious makers in the world, which manufactures not only cars, but also trucks, vans, coaches, tractors etc. The vehicles of this company are very popular and usually break sale records in many countries. The Chevrolet S-10 has been marketed for the customers who like something new and secure in the field of automobile industry. This model is intended personally for those who appreciate quality and comfort in one package. This is an improved variant of previous generations to go on sale for general availability. The manufacturing of Chevrolet S-10 took place in 1994. The model was created in view of previous work and after a series of technical lab and field tests. The Chevrolet S-10 stands out due to its reliability, good quality, excellent design and elegant look. It will become a reliable companion in all your journeys. According to the body style Chevrolet S-10 model is a Pickup Truck that looks elegant, harmonious and solid, and has a convenient configuration. Pickup Truck has always been one of the most common and called-for body styles, which provides a good driving experience, as well as enough room for storage. 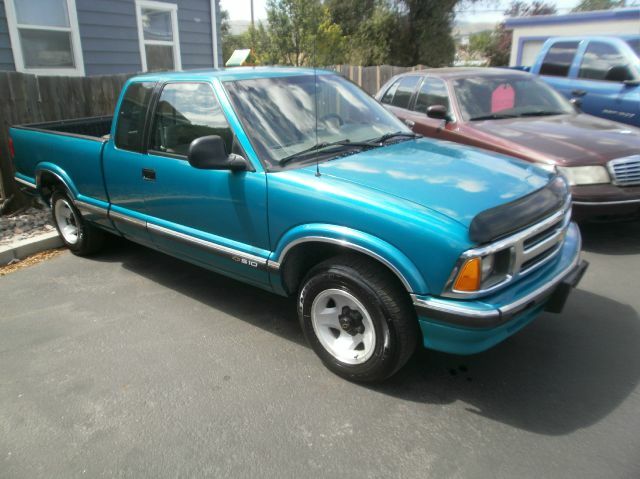 Chevrolet S-10 is available in TEAL, which is a good choice for those who prefer classics. The TEAL Chevrolet S-10 doesn`t look too flashy and too subdued, in fact it makes just the right impression. This shade is easy to replace in case you want to refresh your car or hide any surface scratches. The interior of the model comes in GREY, which is very soft and easy on the eyes. The GREY creates a pleasant atmosphere of coziness in the passenger compartment and doesn`t distract the driver from the road. This color also contributes to the relaxation of the passengers. This Chevrolet S-10 LS 2dr Extended Cab SB is an optimum combination of technology and design. New materials, original colors of the seats and trimming of doors conform to the modern traditions of car design. In this good quality car you will feel like a different person and you will be able to travel as far as you want. The engine of this marvelous car is a V6 that provides an excellent performance and noticeable fuel economy. This engine enables Chevrolet S-10 to accelerate very quickly on any road and in any weather. It will be a pleasure for you and your family to drive this state-of-the-art vehicle. An automatic or a manual gearbox is, of course, a matter of personal preference. The Chevrolet S-10 features a transmission, which is quite easy to operate and provides additional flexibility and a higher level of fuel economy. With this transmission you can get an excellent travelling experience no matter what. You can count the running costs of this vehicle beforehand, because it needs Gasoline and that, in its turn, stands for efficiency and power. With this type of engines the greater economy of petrol can be reached. Your car won`t make you face any break-downs and you will be satisfied with your new purchase. This Chevrolet S-10 has driven as many as 145670. However, we can assure you of its excellent condition in spite of the miles it has covered. Besides, as you can see, we offer you an absolute bargain, so don`t hesitate, read all the specifications and make your decision today! Now, let’s speak about the “ID-card” of your car. With the help of VIN decoding you have all the possibilities to learn more about the automobile’s country of origin, the manufacturer, its age since its launching from the conveyor, and a number of significant technical characteristics. The VIN of this vehicle is 1GCCS19Z6R8179903. Thus, Chevrolet S-10, this perfect style car, is waiting for your decision. Though we are sure it will be absolutely positive! The automobile we’ve examined is required on any type of city streets, when it’s raining and snowing and when the sun is shining – everywhere for everybody whenever you like it!